Sittin 'n Knittin: CeCe fini! C is also for CeCe! OK, so it's been done for like a month, and the photo is crap but her she is! I LOVE this sweater, especially now that the mornings are a bit chilly on the way to work. I think I've worn it every morning for the past week and a half. Cashsoft feels so luxurious, it feels like a treat to wear. Even better, I got this yarn dirt cheap when Knit Happens had that huge sale a while back and it cost me less than $20. Woohoo! Great sweater and isn't it an extra bonus when you're using stash yarn that you got for a song? 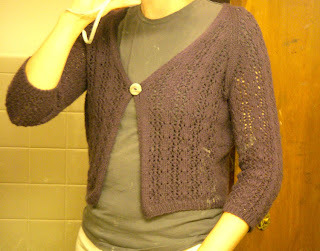 I'm finally using some cascade 220 I also got at the Knit Happens online sale to make Bonne Marie's Ariann. Great minds think alike.